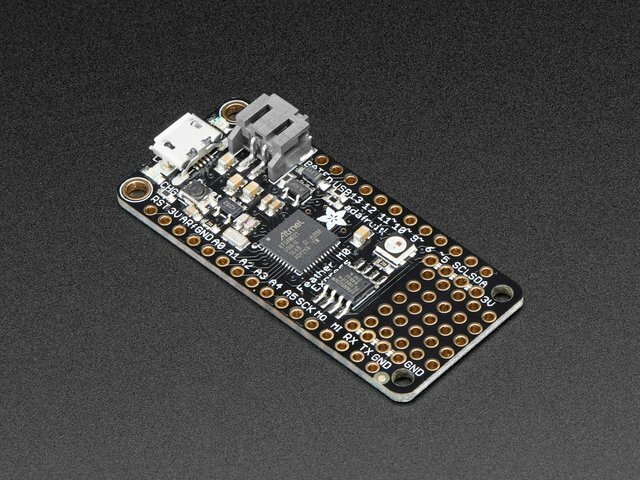 The Feather platform has really gotten my attention recently, especially since its move to using the ATSAMD21 MCU. This is a powerhouse chip based on the ARM Cortex-M0+ core. The other great thing about Feathers is the large (and constantly growing) ecosystem of add-on boards, called FeatherWings. Another thing I’ve enjoyed playing with are NeoPixels. I’ve used them in various formats for a variety of projects. One of the joys is that you don’t need 3 PWM outputs per LED; you just need a single digital output to drive a fairly large string of NeoPixels. 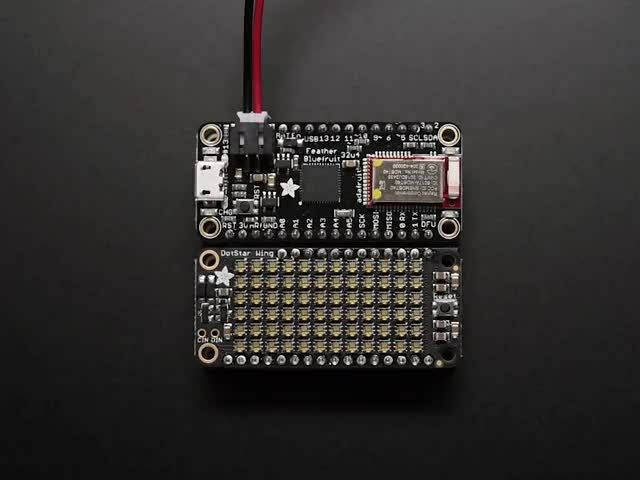 Recently, a new RGB LED has been showing up in Adafruit products: the DotStar. It requires 2 outputs, but is less timing sensitive, and can be updated faster. And it is a lot smaller. The latter point is huge: it means you can pack them denser, getting more pixels in the same space. Adafruit has done just that with their DotStar Featherwing. It packs a 6x12 DotStars in the same space that fits just 4x8 NeoPixels. In case you weren’t paying attention, a FeatherWing is only 50mm by 23mm. That’s small. Lady Ada has packed the space with DotStars so densely they almost touch. That’s enough pixels to make simple images, and display text using a simple font. If you want to work in C/Arduino there's a guide for that. In this guide I'll be walking you through a library I wrote for using it from CircuitPython. Displaying a single color (and “black”) image is straight-forward. It uses a list of strings to encode which pixels are colored and which are off. Uppercase X is used to indicate a lit pixel, any other character indicates an unlit pixel. I’ve found a period to work well visually. The display_image(image, color) function has two parameters: the bitmap and the color to use for "on" pixels. Each line of the bitmap corresponds to a 12 pixel row of the display. Since the display is 6 pixels tall, the bitmap will have 6 such rows. Using a dictionary to map characters in the bitmap strings to colors, a color image can be displayed. The display_colored_image(image, colors) functions takes an image as before, but its second parameter is a color mapping dictionary rather than a single color. To go from displaying a static colored image to an animated one is just a matter of displaying a series of images in sequence. The display_animation(animation, colors, count, delay) function does just that. The animation parameter is a list of images (each a list of strings as before). These are the frames in the animation. colors is the color mapping, again as before. count is the number of times to run the animation, which defaults to 1. Finally, delay is the time in seconds to wait between frames (including the final frame of a sequence and the first frame of the next repetition), and defaults to 0.1 seconds. By using brighter versions of a couple colors, we can make the snow glitter and the star on top of the tree flash. Images that fill the display are fine, but the array is pretty small and we might want to display something bigger. A scrolling display is often the way to do it. To make a scrolling display there are the shift_into_left(stripe) and shift_into_right(stripe) methods. The stripe parameter is a list of colors, one per pixel, that will get shifted onto the display with the first one at the top. The examples below show counting from 0 to 63 (i.e. 6 bits worth) and shifting each number onto the display from the left and right, respectively. Both examples use the numbers_to_pixels(x, color) function that converts the number x to a list of color values: the color parameter when a pixel should be on, and (0, 0, 0) when it should be off. See the section on stripes for more detail. How do we make our own shapes to shift onto the display? How do we make a custom font? How do we come up with those numbers for the slices? Once you have the shape defined, the next step is to look at each column of pixels, and convert them to numbers. This takes advantage of the fact that a pixel, in this case, can be on or off. That is to say, each pixel corresponds to a single binary bit. By adding up the place values where the bits are 1/on we can arrive at a single number to represent the entire pattern. 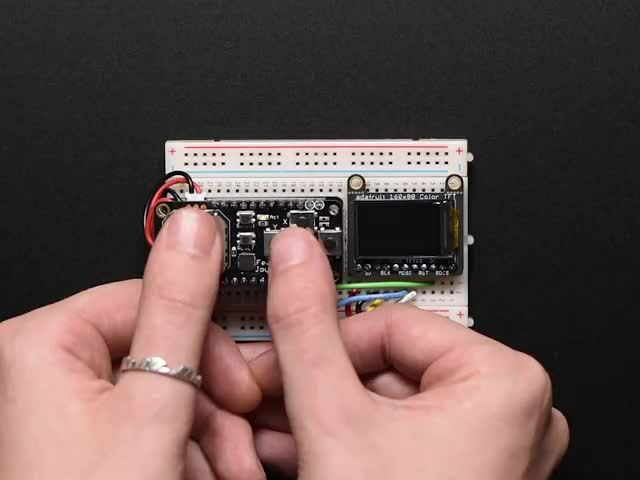 If you are unfamiliar with binary, there’s a great tutorial here on Adafruit. You can download the library as well as the above examples using the button below. Just copy dotstar_featherwing.mpy and font3.mpy to the lib folder of your CIRCUITPY drive and you’re ready to go. The examples shown in this guide are in the examples directory. This guide was first published on Dec 21, 2017. It was last updated on Dec 21, 2017.